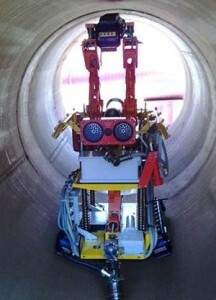 A crawler pig like this one reduces cost and risk during pipeline inspections. Photo courtesy of Alyeska Corporate Communications. This is the story of the Robotic Inline Inspection Tool Team, which received Alyeska’s 2015 Atigun Award for Innovation. The seven team winners, and the dozens of individuals, teams and organizations that supported the effort, were all integral in a game-changing three-year journey that led to the world’s first crawler pig integrity inspection of a liquid pipeline: the Trans-Alaska Pipeline System, known as TAPS. In the summer of 2014, a 200-pound Russian-owned robotic crawler pig inspected around 850 feet of 36 inch buried TAPS piping at Pump Station 3, providing a level of clarity on its system integrity that was previously inaccessible. The success of that inspection resulted in reduced risk and significant cost savings for Alyeska and TAPS. It also inspired similar inspections – as well as similar cost savings and risk reduction – in 2015 and the years ahead. Almost immediately after the 2011 Pump Station 1 spill incident, Alyeska leaders had discussions about risk ranking of all TAPS pipe, the pipe’s expensive replacement options, and new approaches and technology of pipe inspection. Neogi met with a vendor, Russia-based Diakont, at an Outside conference. A few months later, he tested the tool and liked what he saw. Although “simple” in his words, Neogi noted the robotic crawler’s numerous sensors, its three points of contact that allowed for smooth travel around curves and bends, and the instant data it provided. The only problem: the machines had only inspected gas lines, never liquid pipelines. The best news: “It went really well – the pipe didn’t need a single repair, there wasn’t much corrosion,” Neogi said. This year, the inspection tool was used on pipe at Pump Stations 3, 4, 9 and 10. In 2016, it will travel to Pump Station 1 and Valdez. • Submitted by Alyeska Corporate Communications.